My mother and father-in-law were in town for a week and just left this past Tuesday. We had a lot of fun taking them around Houston and showing them our new life here. Just last April they were visiting us in our tiny one-bedroom apartment in New York, so their visit really brought to life how much things have changed for us in the past year (I hadn’t even built this blog yet). Anyways, one of the first things I did after they left was make a new batch of granola. We were running a little low and homemade granola is one of those things that I like to have in my pantry at all times. I usually reach for my go-to recipe, but this time around I decided to switch things up a bit. Sliced almonds, shredded coconut, and almond extract give this simple granola a separate identity from my usual recipe. The coconut really comes through and even my husband loves it–every other time I have tried a new granola recipe he insists that I should just stick to the one that we know and love. I have a feeling my mother-in-law would like this version too. Louann, if you are reading this, I wish I had made this while you were still here! This might sound kind of weird since granola is usually a breakfast food, but I discovered last night that this almond coconut granola is perhaps the world’s best ice cream topping. I don’t know what compelled me to sprinkle it on top of my after-dinner scoop of vanilla ice cream, but boy was it a good idea. It’s equally good with milk or yogurt, but I have to say that having it with ice cream was probably the best idea that I’ve had this week. Preheat oven to 275 degrees and line 1 baking sheet with parchment paper. 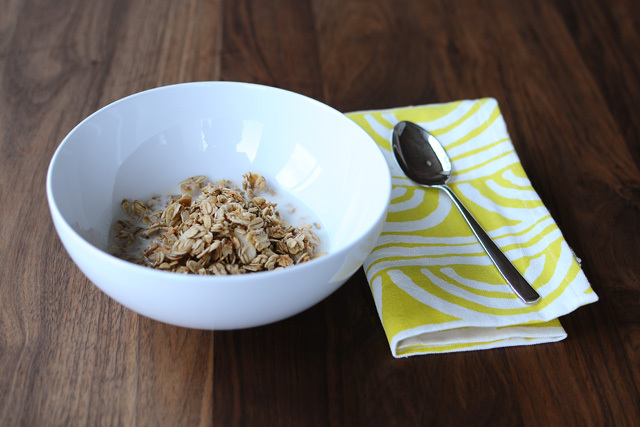 In a large bowl combine the oats, almonds, coconut, and salt. Set aside. In a microwave safe bowl or glass measuring cup, combine the brown sugar and water. Microwave the brown sugar mixture for 1 to 2 minutes or until the sugar has dissolved; be careful not to overcook or burn the syrup and be sure to watch it while it is in the microwave because the mixture tends to bubble up. Add the vanilla and almond extracts to the brown sugar syrup and stir to combine. 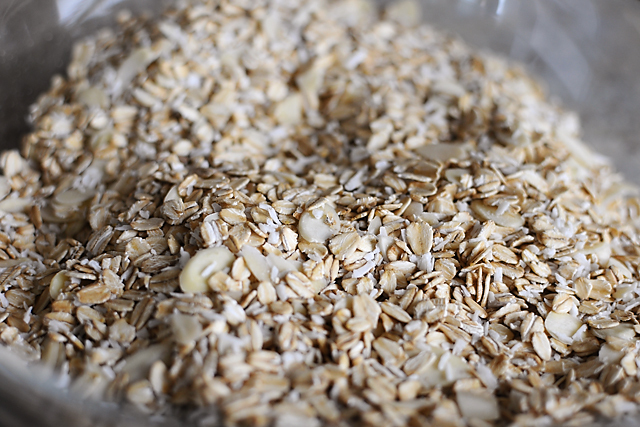 Pour the brown sugar syrup onto the dry ingredients and stir until all of the oat mixture is coated with the syrup. 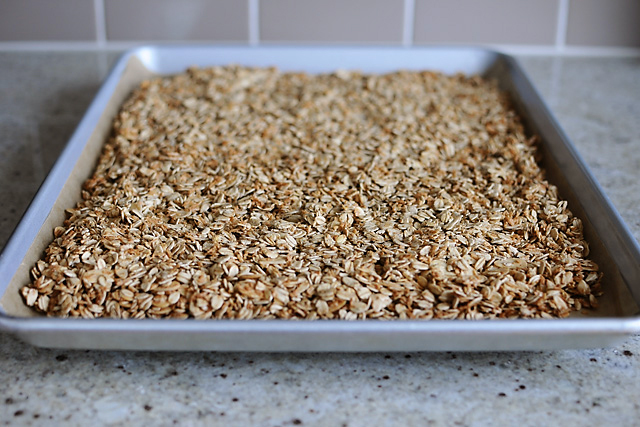 Spread the granola onto the prepared baking sheet and bake for 45 to 60 minutes, until the granola is lightly golden on top and crunchy. Let the granola cool completely and then use your hands to break it up into pieces. Store the granola in an airtight container.